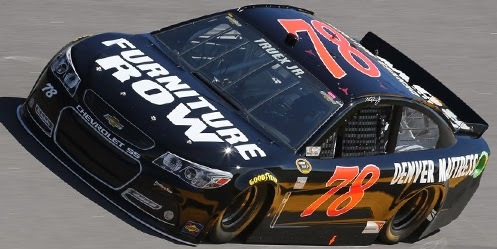 Martin Truex, Jr. picked up the 4th last-place finish of his NASCAR Sprint Cup Series career in Sunday’s 56th Annual Daytona 500 at the Daytona International Speedway when his #78 Furniture Row Racing Chevrolet lost the engine after he completed 30 of the race’s 200 laps. The finish was Truex’s first since Phoenix in the fall of 2012, thirty-nine races ago, when he also started in the second position. To say the least, Truex’s past eight months have been a roller coaster ride. Last June, he finally laid rest to a six year, 218-race losing streak with a convincing win in the Toyota / Save Mart 350 at the Sonoma Raceway. The win put Truex in position to race his way into the Chase at Richmond in September, which he did in the closing laps. But after the controversy surrounding the intentional spin of teammate Clint Bowyer during that race, NASCAR knocked Truex out of the Chase, leading to NAPA’s withdrawal from Michael Waltrip Racing and the end of Truex’s four-year career with the team. Truex found his way to Furniture Row Racing, a team which made the Chase for the first time with Kurt Busch. Like Truex, Busch lost a high-profile ride two years prior and had a breakout season with the single-car team, nearly winning a handful of races and finishing 10th in points. With Busch moving to the new fourth team at Stewart-Haas Racing, Furniture Row hired Truex for the 2014 season. The two seemed to hit it off from the start - Truex was very relaxed during his now-famous poolside media interview over the offseason. Despite skipping the testing session in January, Truex’s new ride was exceptionally fast. After just two laps in the first practice session of SpeedWeeks, he put up a lap of 194.263 mph, the 6th-fastest among 49 drivers. The team skipped the second practice, then in last Sunday’s qualifying session nearly wrestled the pole away from Austin Dillon with a lap of 195.852 mph. Truex ended up on the outside-pole for the 500, his second front row start in the event in five years and Furniture Row’s tenth front row start in less than a year. On Wednesday, Truex timed in 23rd-fastest and was fortunate to miss both multi-car wrecks which eventually cut the session short. The team again skipped the second session of the day, then set their sights on their run from the pole position in Thursday’s Budweiser Duel Race 2. After 60 near-perfect laps, Truex was trying to help his younger brother Ryan Truex make his first Daytona 500, then rejoined the leaders as the field thundered off the final corner. There, disaster struck. Jimmie Johnson ran out of fuel in the outer groove, triggering a nine-car wreck that included both Truex brothers. The nose of Martin’s #78 was destroyed in the wreck, causing an oil fire as he limped across the finish line. Ryan’s #83 BK Racing entry, already one lap down, missed the field for the 500. Sent to a backup car, joining eight other drivers who would have to start in the rear of the field for the 500, Truex and team set their sights on the few remaining practice sessions. With Friday afternoon’s session washed out by rain, Truex put up the fifth-fastest time in Happy Hour, and was confident that his backup was even faster than his primary car. Then came the Daytona 500. Last place first went to Michael Waltrip, also in a backup from Thursday’s wreck, then to rookie Kyle Larson, whose #42 Target Chevrolet cut down tires twice in the opening laps. As Larson fought to get his laps back, Truex was running near the leaders when he suddenly slowed on the backstretch, then ducked out of line. Smoke billowed from his #78, drawing the second caution of the race. The engine had let go, ending his day. The thunderstorm that stopped the race for more than six hours occurred during the ensuing caution, allowing the Furniture Row team to leave the track early for a test in Nashville. Joining Truex in the Bottom Five were former teammate Clint Bowyer, whose engine also let go just past the halfway point, plus three drivers involved in the first of four multi-car accidents that took place in the final 54 laps. Michael Waltrip’s backup car was the first, collected along with Danica Patrick and Aric Almirola. All three had led laps earlier in the event. Six drivers failed to make the 500 field, including three of the LASTCAR contenders described in Wednesday’s feature. Dave Blaney’s only Plinker Arms Ford was lost in a crash on Wednesday while both Joe Nemechek and Michael McDowell ended up off the lead lap in the First Budweiser Duel, keeping both out of the field. In that same race, Josh Wise turned heads with a surprising 5th-place finish, securing him the 11th spot in the 500 field. 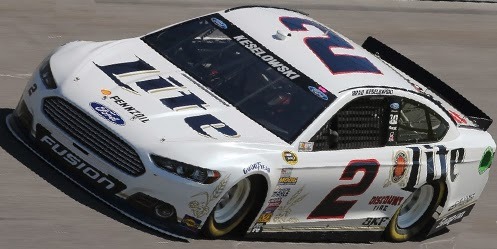 Driving the same Ford that McDowell finished 9th with in the 2013 Daytona 500, Wise came home 24th, recovering from his involvement in the Lap 146 accident to finish four laps down. Next week at Phoenix, Phil Parsons Racing will make the move to Chevrolet, using cars that appear to have been purchased from Furniture Row Racing. 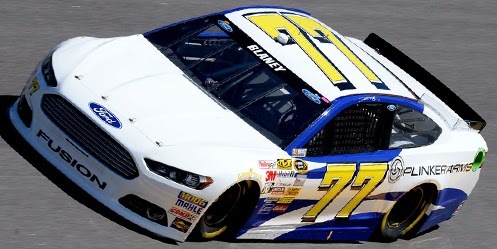 *This is the first last-place finish for the #78 at the Daytona International Speedway. However, the #78 did finish last once on the old Daytona Beach-Roadcourse in 1953 when Indianapolis native Frank Arford’s 1953 Oldsmobile blew a gasket after 2 laps, putting him at the back of a 57-car field. Tragically, on June 20 of that year, Arford became the first NASCAR driver to lose his life in a qualifying accident. The crash occurred during an event at the Langhorne Speedway in Pennsylvania. He was 41. *This is Furniture Row Racing’s first last-place run in the Daytona 500 since 2008, when Kenny Wallace’s #87 Furniture Row Chevrolet lost the engine after 141 laps. Teammate Joe Nemechek two spots ahead of Wallace in the #78. *Truex is the first outside-polesitter of the Daytona 500 to finish last since 1973, when Pete Hamilton’s #9 Housby Mack Inc. 1972 Plymouth lost the engine after 33 laps. That race was the next-to-last of Hamilton’s 64 Cup starts, a brief career highlighted by a win in the 1970 Daytona 500. 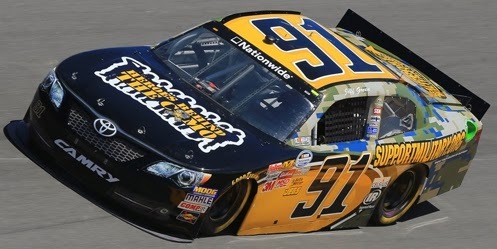 Jeff Green picked up the 54th last-place finish of his NASCAR Nationwide Series career in Saturday’s DRIVE4COPD 300 at the Daytona International Speedway when his #91 Supportmilitary.org Toyota fell out with a vibration after he completed 3 of the race’s 121 laps. The finish was Green’s first since last year at Phoenix, two races ago. It is also the sixth consecutive last-place finish for TriStar Motorsports and the second-straight run for their #91 team, following Michael McDowell’s run in last November’s finale at Homestead. As in his previous rides with TriStar, Green was outstanding in qualifying. He put up the 8th-fastest time at an average speed of 190.783 mph, two positions ahead of Truck Series veteran David Starr in Green’s old #10. It was a huge turnaround for a team that had run just 41st and 18th in the weekend’s two practice sessions, locking him into a race nine other drivers did not make, including Cup driver David Ragan. At the start of Saturday’s race, Green fell to the back of the field along with another LASTCAR record holder, Derrike Cope. Cope, the 1990 Daytona 500 winner, had timed in 35th in the #70 Charliesoap.com Chevrolet and lost a lap early to the leaders. However, it was about this time that Green pulled his #91 off the track, securing him a last-place finish for his fifth consecutive Nationwide Series season. Cope finished six laps down in 37th, claiming a spot in the Bottom Five. Joining Green and Cope were Harrison Rhodes, whose blown engine in the tri-oval brought out the first yellow of the day, Robert Richardson, Jr., who exited the race during that yellow, and Josh Wise in the lone entry for LASTCAR competitors The Motorsports Group. *This was Green’s third consecutive last-place finish in the season-opening Daytona event, all of them coming with TriStar Motorsports. It’s also his fifth last-place finish in the last seven Nationwide races at Daytona. *This was the first last-place finish for the #91 in a Nationwide Series race at Daytona. Jason White picked up the 3rd last-place finish of his NASCAR Camping World Series career in Friday’s NextEra Energy Resources 250 at the Daytona International Speedway when his #93 Drinkagame.com Chevrolet lost the engine after 45 of the race’s 100 laps. The finish was White’s first Truck Series last-place finish since Bristol in the summer of 2010, eighty races ago. Rain canceled qualifying, so White started 31st in the 36-truck field. He turned in the 33rd-fastest speed in the first practice, 24th in the second, and 25th in the third. 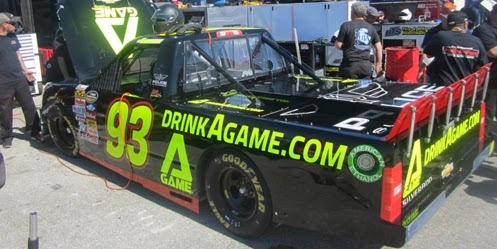 White had driven RSS Racing’s #93 in the 2013 running of the Daytona event, but came home 30th following a multi-truck crash. In the race, French rookie Michel Disdier trailed the field early following an unscheduled stop due to a passenger side window that came loose on his Bobby Dotter-owned #07. He was still running laps down to the field when White slowed in the middle of turn three. White made it to pit road without bringing out a caution, but after the crew looked under the hood, his day was done. The rest of the Bottom Five included four of the sixteen trucks involved in a grinding accident on Lap 75: Chris Cockrum in Mike Harmon’s #74, Tyler Young in the #02, Brian Ickler in his first Truck Series start since 2011, and Joey Coulter for Gallagher Motorsports, a new team making the move from the ARCA series. White’s teammate Ryan Sieg finished 11th after starting 12th in the #39. *This was the first last-place finish for both White and the #93 in a Truck Series race at Daytona. *The 45 laps completed by White are the most ever completed by a Truck Series last-place finisher at Daytona, beating Boston Reid’s old record of 41 in 2006. Terry Labonte finished last in Saturday’s running of the Sprint Unlimited at the Daytona International Speedway when he parked his #32 C&J Energy Services Ford after he completed 1 of the race’s 75 laps. The finish was Labonte’s fourth in the event, leading all drivers in that statistic. 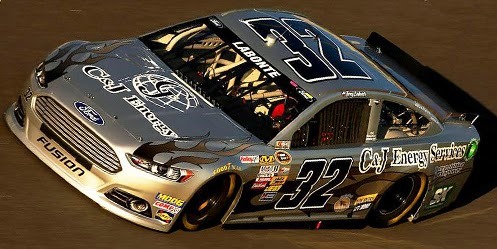 In doing so, Labonte finished last in the Unlimited in consecutive years, following his Lap 2 exit in the #32 last year. Labonte is the only driver to have accomplished this, and in fact he's done it twice: he also trailed the Unlimited in 2005 and 2006. No other driver has finished last in consecutive runnings of this event. This season, Labonte has rejoined the #32 team with which he’s competed on a limited basis since 2011, but now with new partial ownership. Last December, it was announced that team owner Frankie Stoddard would enter into a joint venture, combining the efforts of Stoddard’s FAS Lane Racing team with Go Green Racing, owned by Archie St. Hilaire. Both would continue to campaign the #32 for the full season, using Stoddard’s shop and new crew chief hire Dan Stillman. The combined team is now known as Go FAS Racing. FOX Sports 1 reported Saturday that the Go FAS Racing #32 is expected to be shared beween Labonte, Timmy Hill, and Jeffery Earnhardt. Ken Schrader, who also shared the ride through 2013, retired from Cup competition after last November’s Homestead finale, where he finished 34th in his 763rd career start. On Friday, during practice for the Unlimited, Labonte was just 17th fastest of the 18 drivers in the first session, then slipped to the slowest of the 15 who ran in Happy Hour with a lap nearly two seconds off the pace. On Saturday, his Daytona 500 car turned in the 42nd-fastest time of 49 cars during the first session, then improved to 39th in the second session. For the first time in the history of the Unlimited, the starting lineup to Saturday’s race was determined by a fan vote. 41% of fans selected final practice speeds over two other options: career poles and the 2013 standings. Thus, Labonte’s 15th-fastest time on Friday put him 15th on the grid. After just one lap, however, Labonte pulled behind the wall, ending his night. Rounding out the Bottom Five were Jimmie Johnson, involved in a single-car crash on Lap 28, plus Danica Patrick, Ricky Stenhouse, Jr., and Kurt Busch, three of the seven cars eliminated in grinding crash in the tri-oval on Lap 36. In all, just eight of the eighteen starters finished the race. This week, Labonte will attempt to make the field for the Daytona 500, a win that has eluded him in 31 previous attempts. Labonte has twice finished 2nd in the event in 1990 and 1997. He also has dark horse potential for next week’s 500: in his three previous runs driving the #32 in the event, he has finished no worse than 20th with a best finish of 15th in 2011. *Labonte is the first last-place finisher of the Unlimited to have the listed reason out as “parked.” In Labonte’s three other last-place finishes, however, he has either withdrawn before the start of the race or pulled behind the wall in the early stages.